Many times, the most profound and life-changing messages come from soft-spoken and humble messengers, and that’s certainly the case with author Jim “Bubba” Bay, who will be speaking at Ridgefield’s Angel Cooperative on Saturday, March 17. Nine years ago, late one November night, Jim Bay went out for a walk near his home in Pine Plains, New York, and stepped backward to avoid an oncoming car, only to plummet 20 feet into a rocky ravine, breaking 23 bones in his body, including his skull and 11 ribs. 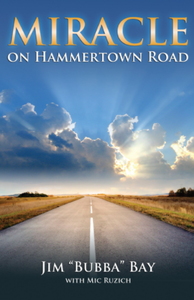 What happened next, as Bay contemplated the shock that no doubt lay in store for the person who might find his body days later, inspired the title of his 2014 book, “Miracle on Hammertown Road.” In this memoir, Jim Bay not only describes the remarkable experience of his conversation with God, appearing in that “white light” that has been mentioned by so many people who experience a Near Death Experience, but he also describes how he found peace following the death of two of his six children – his infant son James, and his teenage son Robert. Jim “Bubba” Bay will be speaking at The Angel Cooperative in Ridgefield, Connecticut at 3:30pm on Saturday, March 17. To register for this event and to learn more, click HERE.